Powers: [Formerly]Winged flight with sonic vibrational capacities, Acid spit and Insectoid physiology. [As Tech User] Her suit gave her the power of Pyrokinesis and Cryokinesis. It also granted her flight. Angel salvadore grew up in an abusive home with her father mother and younger sister. When her powers manifested her father kicked her out and she was almost dissected by the U-men, who planned to harvest her mutant organs. 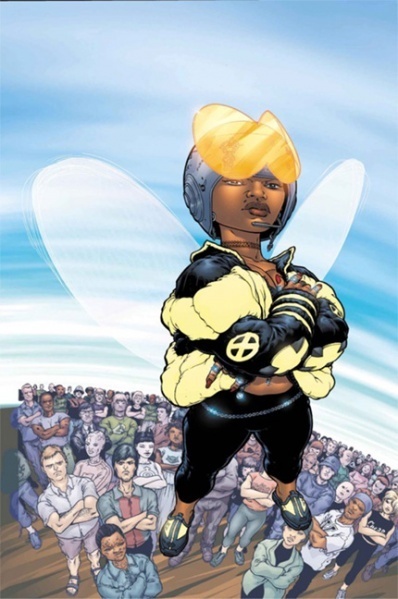 She was saved by wolverine and taken back to the Xavier institute during the big mutant boom after genoshas destruction. There she clashed with Emma Frost, was instrumental in defeating Cassandra Nova and fell in love and mated with fellow mutant Beak. They lived with their children at a cabin in the woods on the Xavier estate up until M-day when she and her family were de-powered, all except one of her children. She would go on to become Tempest in a failed re-hash of the new warriors group post civil war.